The eSonic2 is a revolutionary new and unique 2-pickup system (NanoFlex™/NanoMag™) that allows you to blend or seperate each pickup with it's 1/4" stereo outputs. Epiphone is excited to announce three clinics with Annihilator and Epiphone Signature guitarist Jeff Waters. 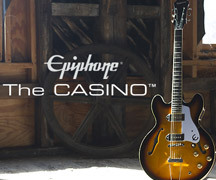 The Epiphone Phant-o-matic was officially announced in October 2011 and has since received rave reviews. James Durbin of American Idol fame performed on VH-1's "Big Morning Buzz" this morning. Enter to win an exclusive a meet & greet with Machine Head or Bring Me The Horizon Backstage at one of their December UK shows. Two lucky winners will also take home a signed Epiphone "1958" Korina Flying-V or an Epiphone Les Paul Standard guitar. Simply "Like" Gibson Guitar UK Facebook Page to enter this contest. Epiphone has been a favorite of heavy metal artists for over decade not only for their great technical advances but also for their artist collaborations that have often pushed the envelope in guitar design with groundbreaking results. Now, Epiphone has done it again with the Epiphone Robb Flynn Love/Death Baritone Flying-V, designed in cooperation with Robb to be Epiphone's heaviest guitar (and we don't mean weight-wise) ever. Epiphone is proud to present two models that offer players the vibe, feel and sound of true classics with modern reliability, and at a price that the average musician can afford. You can learn chords by memorizing a chord chart and playing them in songs, but the more you know about how chords are put together, the better you'll be able to relate them to scales, melodies and harmonies. For years, aspiring guitarists have been asking for a video game that allows you to use your own guitar while also teaching you how to play---for real. Well, the future is here! Designed in collaboration with Frank Iero guitarist for multi-platinum band My Chemical Romance, the Wilshire Phant-o-matic combines an incredible array of features that only Epiphone would dare put in one instrument.